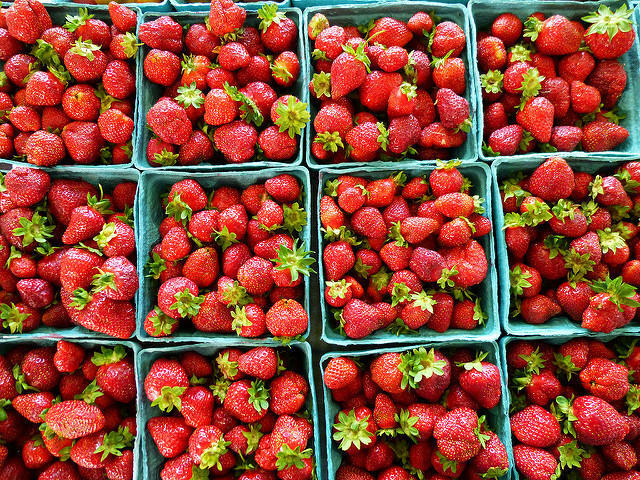 First of all, we should be aware that the best Maryland strawberries are usually on the smaller side. The big golf ball sized berries may look impressive, but that patch of white under the stem tells you that they will not be as tasty as you'd expect. Look for the smaller berries, about the size of a finger tip, deep red all over, and with a gorgeous aroma. In fact, buying by smell is nearly foolproof. In preparing salads one rule of thumb applies: you can use strawberries wherever you would use tomatoes. It works! And speaking of salads, here is a lovely vinaigrette featuring strawberries. Blend strawberries, honey, apple cider vinegar, olive oil, salt, and black pepper together in a blender until smooth. Store in a closed jar in the fridge. To take the point one step further, here's Jerry's strawberry based BBQ sauce, a condiment ordinarily dominated by tomatoes. Process strawberries, chili sauce, vinegar, Worcestershire sauce, lemon zest, lemon juice, minced garlic, brown sugar, salt, and cayenne pepper in a food processor until smooth, 15 to 20 seconds.